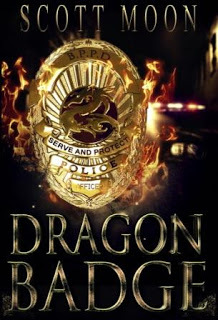 This book Dragon Badge by Scott Moon is a hot mess. With an emphasis on hot. This guy can write. You might not know it from reading the bit on the back cover of the book because the plot description seems tawdry. But seriously, Scott Moon is fantastic. I know that people only write stuff they feel passionate about so I've blown off writing any book reports on a number of books I've read recently and didn't care about. But this book is both brilliant and almost completely structure free. I'm going to make the supposition that Scott Moon is such a good writer that it actually becomes a fault. He's too good a writer for his own good. Every page of Dragon Badge is immensely compelling. Reading it you're all like "Yeah! I love this character! What's going to happen next??!!" And then four pages later you're following another character. You still have the same reaction to the new awesome character, but eventually you'll think "Wait, what happened to that character three characters ago?" Another brilliant and strange thing about this book is that it's a supernatural fantasy with very realistic police drama, racial politics, and social tension. I mean it's really well written. So when the inciting incident doesn't happen until page 208 you're not frustrated in any way, you're just like "Oh, okay then." I mean seriously. This is one of the best cop novels I've ever seen. And, you know, the slug line for it might be particularly awesome. A beat cop has to team up with the thug who killed his partner in order to defeat a sorcerer. Cops having to team up with criminals is cool, cops who have to team up with a cop killer is a freaking awesome idea. And there are awesome moments and details. We do switch around the POV character quite a bit and for a while we follow the thug dude, Klinton. And if I haven't mentioned it, it's pretty brilliant. See? This would make a great TV series. This is what we should be doing.